‘CAUSE WE WANT YOUR WORDS ON STAGE INSIDE THE PHOENIX PUB! And to that end we give you everything you need to claim victory, including but not excluding, five judges, two MCs, one stage, The Score Adder, a Phoenix Pub, an audience, two microphones, an ever-growing space-time continuum of first prizes, one sacrificial poet, one sound guy, The Master of Conflict, and a spectacular light display. And this month we feature Candy Royalle. And this month we have our Brass Knuckle Brass Band brass band house band. Join BAD!SLAM!NO!BISCUIT! 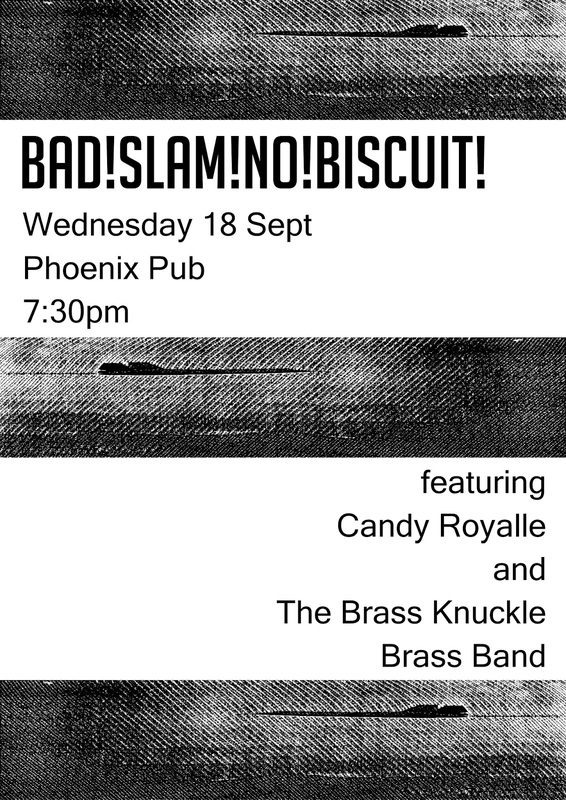 at the Phoenix Pub for BAD!SLAM!NO!BISCUIT! and remember 2 minutes, no music, no props, your original material (unless you’re a rebel, we welcome rebels).